The word Rudraksha has been taken from Sanskrit words "Rudra" and "Aksha" �Rudra� is another name of Lord Shiva, and �aksha� means teardrops. 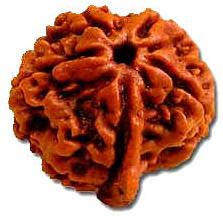 Rudraksha is a natural bead which has medicinal properties and used in many of others field. Rudraksha exactly stand for the eyes of Shiva involve that it was enjoyable to the eyes of Rudra and was named in his respect. It is supposed that the person who wears Rudraksha is unaffected by sins, and is protected from all sinful activities or thoughts. Rudraksh bead provides many advantageous effects to the wearer. It has no any negative effects. The sacred Rudraksha beads are important in use as their healing properties and being identified for various physical and mental problems. Rudraksh bead posses electromagnetic nature due to this it affect our neurophysiology in a specific manner that permit to control heart beat, blood pressure, stress levels, hypertension and at the same time relieves nervousness, depression and fearful situation.